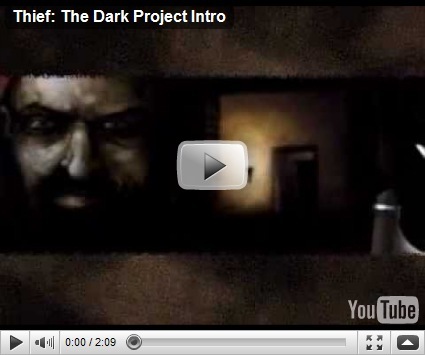 In 1998, the now-defunct Looking Glass Studios published Thief: The Dark Project through Eidos Interactive, and Garrett set out on his first-person, 3D adventures. The original game was expanded shortly after as Thief Gold, with both bug-fixes and additional content. Many game reviewers considered it the game-of-the-year for 1998. 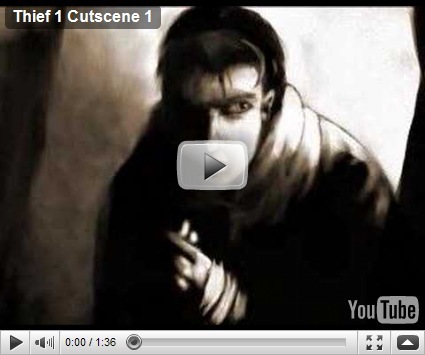 Thief II: The Metal Age followed in 2000. Again, many game-of-the-year awards followed. A gold release was in the works. Sales were strong, but one publisher backed out of a development deal near the end of production, and Eidos diverted Looking Glass’ royalties to prop up development at the troubled Ion Storm studio. Looking Glass could have survived one or the other. That both happened simultaneously spelled the end for this award-winning developer, just when sales were at their peak. Ironically, Ion Storm itself made the third game in the series (Thief: Deadly Shadows) in 2004, and Eidos Montreal is presently working on a fourth. Garrett’s focus is on stealth. In a pinch he can fight, but even the least guard can cause him trouble. Besides, bodies and blood tend to make people alarmed. Fighting is messy and best avoided. The Thief games provided a setting and goals, and left it more-or-less up to the player as to how to achieve those goals. It was, perhaps, an almost perfect PC game series, making good use of the mouse and keyboard, as well as the memory and resources that distinguish the PC from game consoles. The third game attracted considerable criticism for the concessions that were made in order to enable it to run on an Xbox, but those notwithstanding, it is still a worthy entry in the series and provides closure to the story Garrett began at the beginning of the series. Sprawling areas are the primary hallmark of much of the series. Mansions, manors, tunnels, sections of city, ruins, vast necropoleis and more. The victorian/medieval architecture lends itself to quite a number of possibilities for entry, and so your decisions begin. In most cases you’ll want to case the exterior before deciding on a method of entry. Of course the obvious ones will be locked, patrolled or otherwise guarded. That doesn’t mean they cannot be used. The AI that powers guards, servants, civilians, animals, undead and the city watch is more than serviceable for the task, and sound is beautifully modelled. Sound carries, but is diminished as it passes around corners or through barriers, and the AI scales through different alert levels with sufficient plausibility. Guards investigate unusual sights and sounds and will search carefully, pursue, flee and/or call for backup as seems required. In later games, guards become more responsive to things that are out-of-place: Objects moved or missing, guards not at their posts, doors left open, and more. Garrett’s primary tools in dealing with guards is to hide from them (concealing himself in the shadows), distract them, or rap them over the back of the head with his blackjack. Of course, unconscious bodies can’t be left laying around any old place. They cause nearly as much alarm as corpses do. Locks can be picked, objects mantled, lights snuffed out. You can pass like a ghost, unseen and unmarked, with nothing to betray your passing but the lack of any valuables in the morning – or you can neatly pile the unconscious bodies of every guard and servant in a pile in Milord’s private bathroom while he sleeps. The story is engagingly told during a mix of missions and cut-scenes. Gameplay objectives may change suddenly with changing circumstances. Each mission has a configurable difficulty which sets your goals and your rules of engagement. The cynical Garrett is beautifully voiced by Stephen Russell, who is a treat to listen to, and the writing is clear and witty throughout. The art style and designs are distinctive, and texturing is serviceable. Audio is vital, and well done. Headphones and a dark room are recommended add-ons. Unfortunately, Thief 1 and Thief 2 don’t really like more modern operating systems (like Windows 2000 and Windows XP). You can arguably get either one going under Linux with Windows 98 compatibility to some degree or another. Getting Thief 1 and 2 working under Windows XP is … arduous and for various reasons (not limited to aging codecs) will just plain not work on some systems, while working on others. You might have some more luck with the bundle at GamersGate. I haven’t tried it, but if you have any success with it, by all means let me know. Thief 3 is much happier on modern systems, though not without some glitches on some multicore systems, and is not expensively priced on Steam – though you can almost certainly get it for much less in the bargain bin at your local games store. Garrett will be lied to, manipulated, betrayed and used by pretty much every faction, and will end up saving the world … more than once.